These are open sores that usually develop on the inside lining of one's oesophagus, stomach and the upper portion of the small intestine called duodenum. There is no single cause for ulcers. However, it is quite clear that an ulcer is the end result of an imbalance between the digestive fluids in the stomach and the duodenum. 1. Oesophageal ulcers occur inside the hollow tube that carries food from one's throat to the stomach. 2. Gastric ulcers occur on the inside of the stomach. 3. Duodenal ulcers occur on the inside of the upper portion of one's small intestine (duodenum). • A bacterium called helicobacter pylori which commonly lives in the mucous layer that covers and protects tissues, stomach lining and small intestine could be the cause. This bacterium causes no problems but it can cause inflammation of the stomach's inner layer, thus producing an ulcer. • Frequent use of painkillers can aggravate or inflame the lining of one's stomach and the small intestine. An individual may be at an increased risk of developing peptic ulcers if he or she smokes and consumes alcohol. 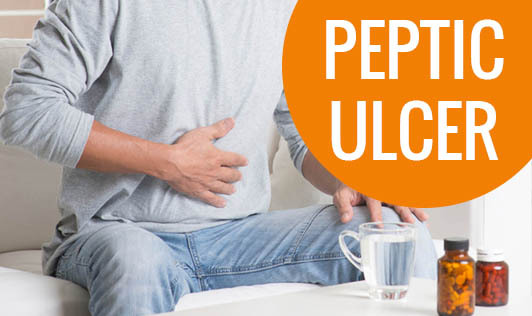 Contact your doctor if you have unrelenting signs and symptoms of peptic ulcers that trouble you!